What is a hapless blogger to do when two very inviting memes occur on the same day? Today is Garden Bloggers Foliage Day, sponsored by Christina at Creating my own garden of the Hesperides, but it is also In a Vase on Monday, hosted by Carol at Rambling in the Garden. Last week was exactly the same. It was Monday for the vase but also Garden Bloggers Bloom Day, sponsored by Carol at May Dreams Gardens. I just did two posts then and will do so today. I hope that isn’t cheating. The foliage in my garden is feeling the heat, as we all are. The Japanese maple (Acer palmatum dissectum ‘Ever Red’) which is the focal point of my back garden is beginning to show the advance of summer as its lovely red color is fading to green. It is still a beautiful tree, but I will have to wait to fall before it turns red again. So far the hostas are holding up well, albeit with dedicated hand watering on my part. They are adding a continual touch of foliage color. A barberry and weigela, both in full sun, are also seeing their spring color fading to green. 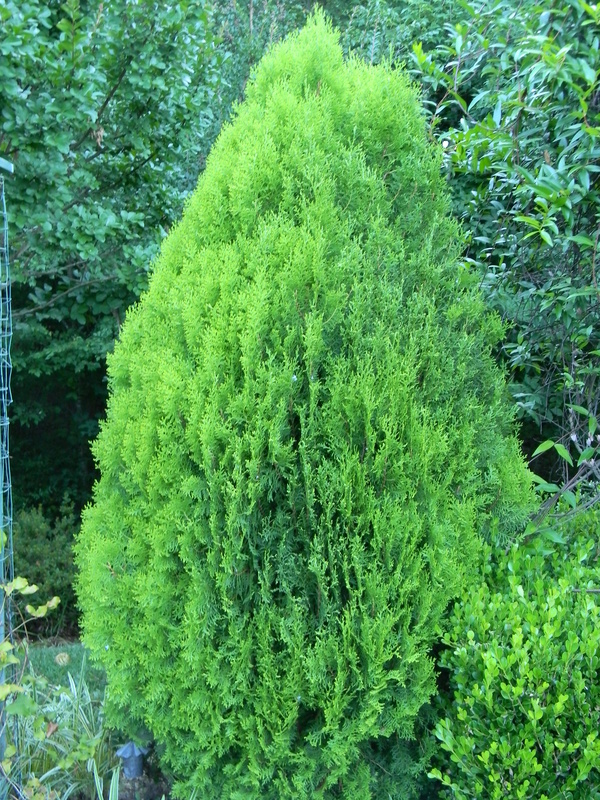 I have three Berckman arborvitae (Thuja occidentalis Berckmanii) in various spots in the garden, and their lime green foliage is holding its own in full sun and heat. Contrast in form, shade and size is provided by aucuba, Japanese cleyera, English boxwood, and Siberian iris. 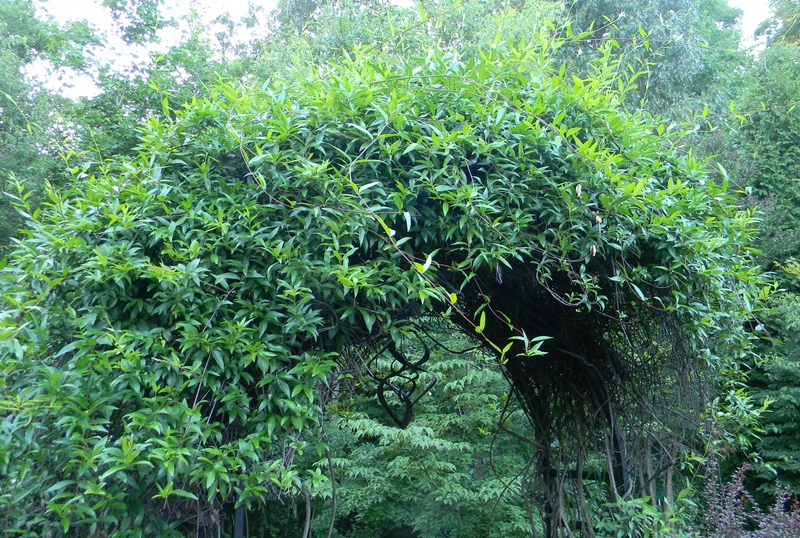 The Carolina jessamin (Gelsemium sempervirens) did not bloom well this spring, and I thought about cutting it back drastically and let it start over on the arbor. Looking at it now, however, one can see that it is lush with new growth. Perhaps we will see a few of its yellow blossoms this fall to tease us for next spring. I decided that I would NOT show the foliage eaten down by the critters or the wilty places. This entry was posted in Gardening, GBBD, GBFD, In a Vase on Monday and tagged Acer palmatum dissectum, Ajuga reptans Mahogany, Aucuba japonica 'Mr. Goldstrike', Berckman's arborvitae, boxwood, Carolina jessamin, Encore azalea 'Autumn Lily', Ever Red Japanese maple, foliage color, Gelsemium sempervirens Carolina jessamine, Hosta 'Empress Wu', Hosta Captain Kirk, hosta Patriot, Iris sibirica Caesar's Brother, Japanese cleyera, Japanese maple, Royal Purple barberry, Siberian iris, Variegated liriope, Weigela florida Wine and Roses. Bookmark the permalink. I feel honoured that you wrote two posts today, John, thank you. You have masses of beautiful foliage, the Hostas are an inspiration to those who suffer the invasion of slugs and snails, yours are perfect. We’ve been lucky so far with the hostas. The critters have avoided them, but we’ll see….. Your hostas are stunning! They are super foliage plants, especially for shady areas where lots of plants won’t flower. Your Acer is certainly making a statement, leaves either red or green it is beautiful! Thank you, Pauline. I have several “purple” plants that tend to go green when the weather gets hot. I’m keeping my fingers crossed about the hostas. I didn’t know the phenomenon of colored foliage drifting to green in the heat. Very interesting. Everything look lovely. Hope you get some relief from this heat soon. Color change in purple/red foliage is something i have noticed for a number of years. Finally have a break in the heat. Wonderful! John, enjoying this site. Jack just passed email to me. See you at 4 o’clock for a lovely event. And lovely it was. Glad to see you both there. Looks good! I hope by now you have had a little rain and some relief from the dry hot weather. The jasmine seems to enjoy it regardless! Thanks. We’ve been away for four days and am quite pleased with the way things have survived.